Elk were once abundant throughout the United States, but by the mid-1800’s, over-hunting and habitat loss wiped out eastern elk herds. 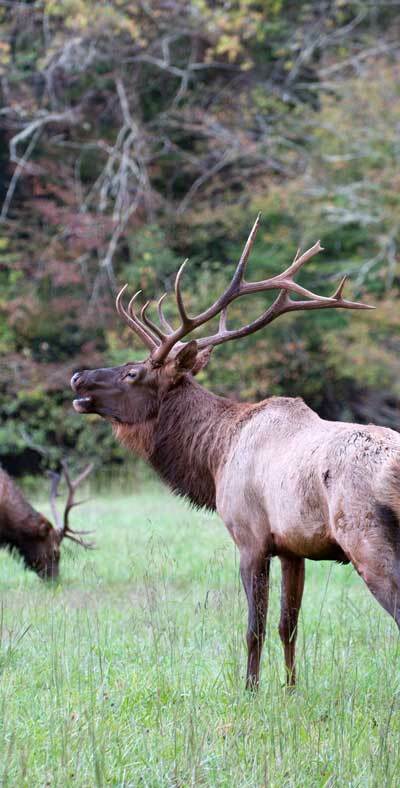 In 2001, the Rocky Mountain Elk Foundation, the National Park Service and other partners joined together to restore wild elk to the Smoky Mountains in the Cataloochee Valley near Maggie Valley. The initial 52 elk that were released have grown to a herd of almost 200. Fall: The elk’s fall breeding season is known as the rut (mid September through the end of October). The mating call of bulls is called a bugle and can be heard during the breeding season. Even if the elk are not present, people are not allowed to walk into the fields. During the rut, male elk make bugling calls to challenge other bulls and attract cows. Dominant bulls use the fields to gather and breed with harems of up to 20 cows. Bull elk actively defend their territory by charging and sparring with competitors using their antlers to intimidate and spar with other males. Encroaching too close may lead a bull to perceive you or your vehicle as a threat causing them to charge. When elk are present, federal regulations require that you remain at least 150 feet away and at a distance that does not disturb them. Failure to do so can result in fines and/or arrests. Even if the elk are not present, people are not allowed to walk into the fields. During the rut, male elk make bugling calls to challenge other bulls and attract cows. Dominant bulls use the fields to gather and breed with harems of up to 20 cows. Bull elk actively defend their territory by charging and sparring with competitors using their antlers to intimidate and spar with other males. Encroaching too close may lead a bull to perceive you or your vehicle as a threat causing them to charge.